Ever since I made my first booking with Stayzilla some 6 months ago [review here], I’ve been regularly using this website for my accommodation needs. Overall their service is satisfactory. No disappointments as such. But they do have scope for improvement.At times inventory on the website is not real time. I'd first booked at Wayanad Gate Hotel, I was later told it is sold out and then I had to rebook. Similarly too many offer emails also have begun to annoy me. I can’t travel just because there’s an offer. I need leave, need to plan travel, need to team up friends etc, so I will book a room with or without offer when I want it. I won’t book rooms just because there’s an offer. Probably I should unsubscribe. 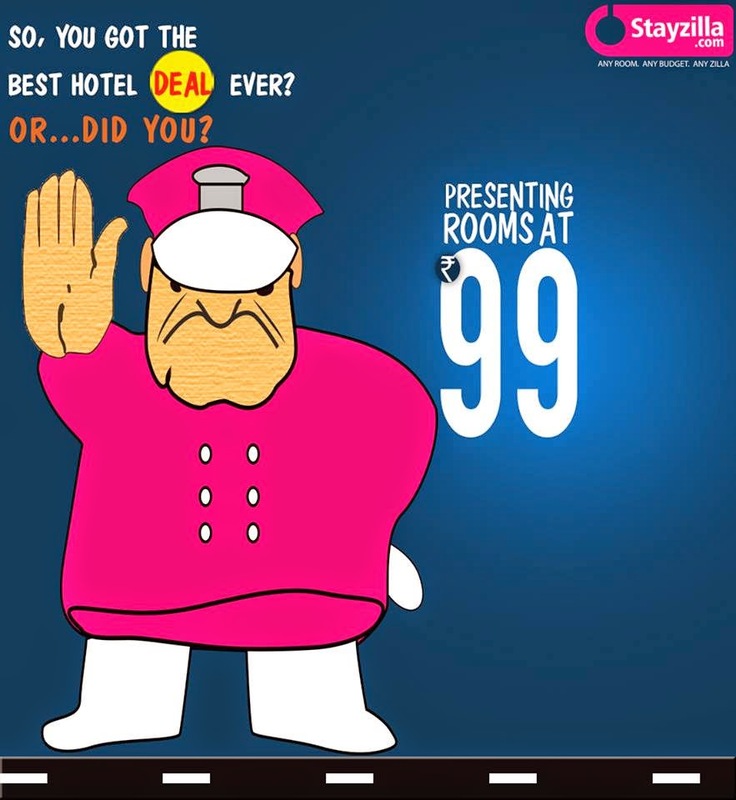 Rs 99 hotel rooms: Stayzilla advertised a Rs 99 a night hotel offer- found out that it is some sort of flash sale for some remote location and one specific hotel, for a very short duration. Not really practical. Even if I had got a room for Rs 99, I would have to spend a fortune reaching that place. Not sure how many managed to book rooms at Rs 99.I think they should avoid this kind of sales gimmicks and just focus on giving good service. Still there’s no provision on the website for user reviews. If they can let their customers write a few lines about the hotel after their stay, it will help future customers a lot. By and large their customer service has been very efficient. But a few practices sometime irritate me. For example, on the day of check-in, they keep calling to ask what time I will arrive, what time I will check in etc. Their intention is to call the hotel and keep the room ready when we arrive. Their intention is noble but most of the time I will be driving, visiting some places on the way and reach the hotel by evening and I can’t tell exact time of check-in. If I’ve selected check in at 12 noon, hotel should keep the room ready by 12 noon. I may check in at 12 noon or 4 PM that is my choice. Why should I be called again and again to ascertain my check-in time? Each time I get the call, I have to pullover, take the call, provide some estimated time, loose several minutes and few rupees of roaming charges in the process. I would appreciate some more liberty in this- less calls and rooms should be ready any time after pre-specified check-in time. Another thing I noticed that hotel owners/managers do have good respect for stayzilla. 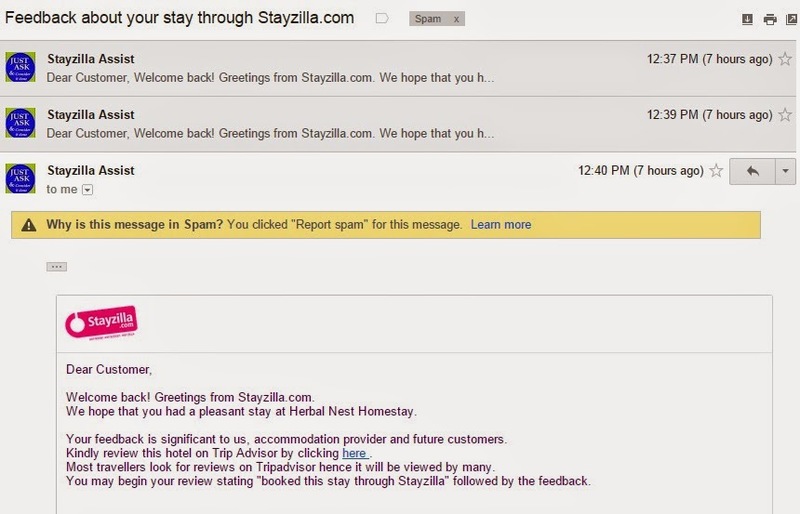 I will continue to use stayzilla, but would appreciate if they can reduce spam, provide for customer feedback and make their chat guys little more well informed and responsive.